Cavalese Fiemme Valley holidays on line mountain travel hotels bed breakfast residence self-catering accommodation. Val di Fiemme streches for 35 km in the northeastern Trentino region and it is one of the most beautiful valley in the Alps, offering a charming Dolomites landscape characterized by woods that cover the mountains along the Avisio torrent crossing the entyre valley. All the area has a strong tourist appeal and it boasts a secular hospitality accommodations and a perfect combination in respect of nature, culture and tradition. Val di Fiemme is a tourist area a lot attended in the winter season for its skiing area dipped in a magnificent scenery, that it boasts more than 100 km of slopes connected by modern lift system, it is an ideal place both for the alpine and cross-country skiing. The cross-country ski is practiced in the localities of Passo Lavazè and Tesero Lake which are connected to the famous Marcialonga tracks and it offers a range of 150 km of every difficulty. 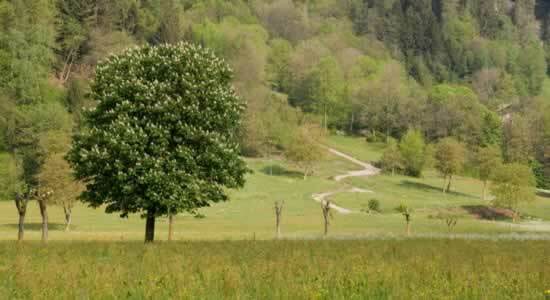 Val di Fiemme boasts an unpolluted nature ideal for pleasant walking, it offers many paths for joggings, and numerous cycling lanes. Very popular is also sport climbing that is practiced both on the Dolomites than in the equipped indoor sport palace. The small villages scattered in the wide lower valley offer moreover many opportunities for the body and mind relaxation. The most famous localities in Val di Fiemme are Cavalese, Predazzo and Tesero, the valley is surrounded by the Paneveggio and Mount Corno Natural Parks. The territory offers many holiday stay possibilities in optimal hotel accommodations or bed and breakfast, vacation apartments and campings. Val di Fiemme can be reached by car on the Brenner motorway from the exit of Egna-Ora and along the Dolomites national road to Cavalese and Predazzo, or by train from the railway stations of Ora, Trento and Bolzano that are connected with public line bus to the villagges of the valley. The Bellaria Hotel is a three-star hotel in Val di Fiemme, located in the town of Predazzo. The hotel guests can make use of the fine restaurant, the fitness centre, the swimming pool and the free car parking lot. The rooms of the Bellaria Hotel are all equipped with a safe. Bolzano is at about 20 minutes' drive, while in no time you can reach the ski slopes at Latemar. Book a hotel on the ski in Val di Fiemme! For your skiing holiday week choose to stay in a hotel or accomodation close to the ski tows. Check our offers for weekends and skiing holiday weeks in hotel in Val di Fiemme by the ski runs. Don't give up the pleasure of leaving the hotel with your ski is on! is a pleasurably hint among gourmands and lovers of traditional cooking. The cuisine is both innovative and deeply rooted to the region. Hotels with parking in Val di Fiemme ? If you have decided to travel to Val di Fiemme by car or motorbike, don't worry about finding a parking space or leaving your vehicle unattended. Display the list of hotels and accomodation in Val di Fiemme provided with a parking place or a garage. Book a hotel in Val di Fiemme with a parking area! Pet-friendly hotels in Val di Fiemme ? Don't leave your dog at home. Use our guide to check the list of hotels and accomodation that welcome dogs in Val di Fiemme. It is also possible, from our selected list of hotels and accomodation where animals are allowed in Val di Fiemme, to keep your dog in the room with you! Check our offers of hotels and accomodation in Val di Fiemme with rooms equipped for the disabled! For your stay in Val di Fiemme, book a hotel accessible to disabled people. Choose your hotel in Val di Fiemme from the list of hotels equipped to welcome disabled people! Wi-Fi hotels in Val di Fiemme ? Are you looking for a hotel or accomodation with a quick internet access and wi.fi? Click on the list of hotels in Val di Fiemme which have a wireless connection to internet and wi.fi. Gay-friendly hotels in Val di Fiemme ? Look for gay friendly hotels or gay friendly accomodation in Val di Fiemme, choose to sleep in a gay friendly hotel or gay friendly accomodation in Val di Fiemme! Take advantage of our offers of gay friendly hotels or gay friendly accomodation to book your holidays in Val di Fiemme.